Today evening promises to be exciting. Our kids have organised a get-together. Some close friends have been invited. We are all busy making cupcakes, chocolate cake, cookies, and Mendiants. Making goodies together gives joy. 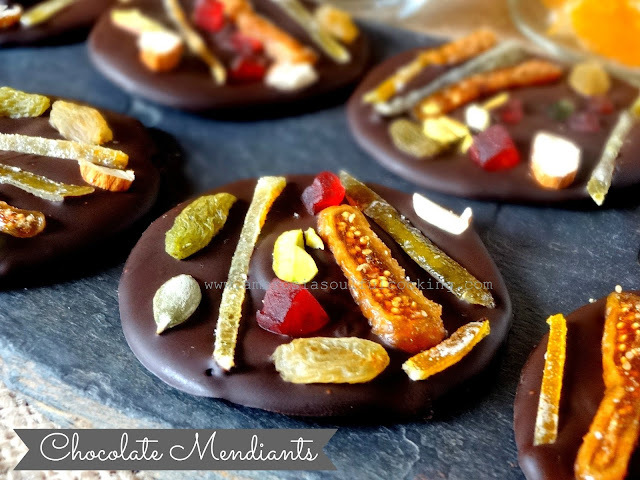 Mendiants are a French confection that is popular at celebrations or given as gifts on Christmas. 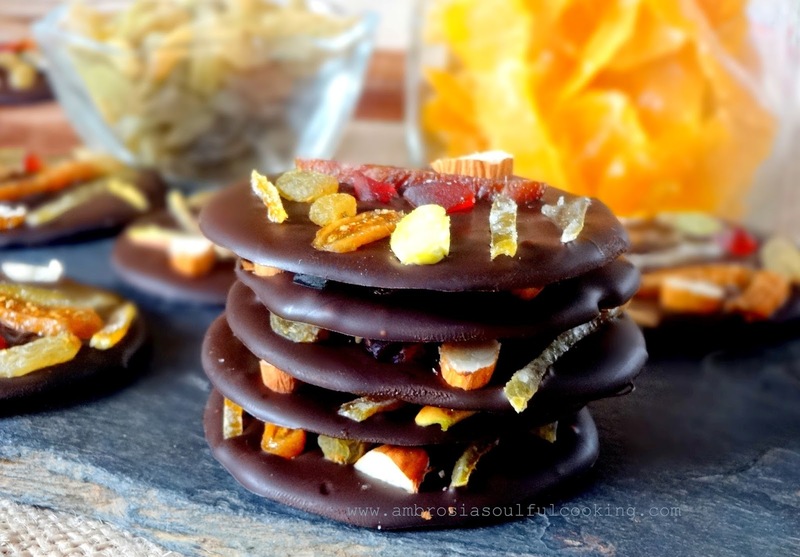 They are chocolate discs studded with dry fruits and nuts. 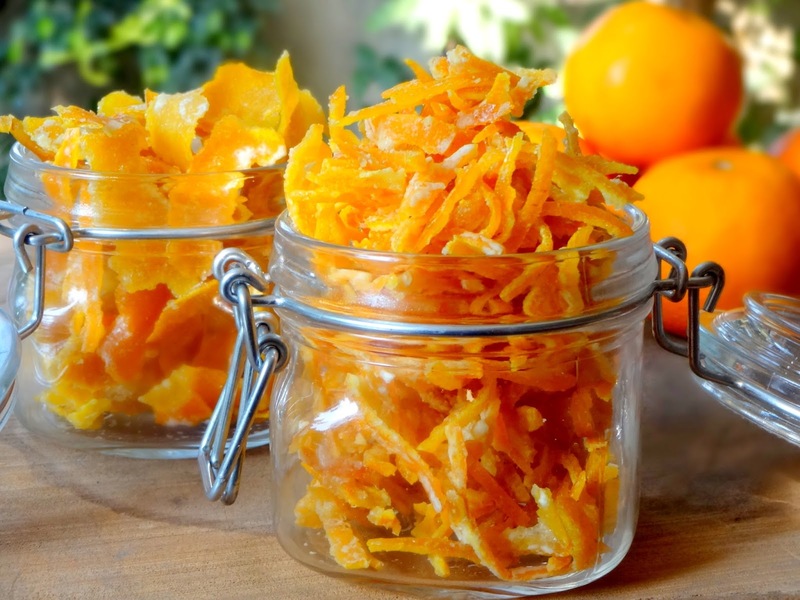 We added a lot of candied peels that we made last weekend. Some Lemon peels were also added. Kids love to participate in making them. Make them around Christmas or any special occasion, it is always enjoyable to assemble them with dry fruits and nuts of choice. Break chocolate into small pieces. Melt in a double boiler. While the chocolate is melting, take a parchment sheet big enough to cover your baking tray. Make circles of 2 1/2 inches with a pencil. Turn the sheet. Circles must be visible. Pour 1 tablespoon of melted chocolate inside the circle and spread with the back of the spoon to get a perfect circle. Arrange dry fruits and nuts. Repeat till melted chocolate is over. If the chocolate becomes firm melt again and continue. Keep the tray with Mendiants in the refrigerator for an hour. My Tip: Prepare Mendiants with one slab at a time. Reheat chocolate as needed. Use your creativity in decorating the Mendiants. Use pepita seeds, walnuts, cashews etc. This looks something out of a master chef kitchen or an expensive italian dessert. And the best part is that it is so easy to make and looks heavenly. Thank you for the recipe.